Many species of bats found across China are infected with viruses similar to the SARS virus, an international team of researchers reported on Thursday. Zhengli Shi of the Chinese Academy of Sciences in Beijing and colleagues sampled more than 400 bats of various species across China and found up to 70 percent of some species showed evidence of infection with SARS-like viruses. This would support the idea that bats are the reservoir—the natural host—of the virus. Animals that act as reservoirs carry and spread a virus without themselves becoming ill. Severe acute respiratory syndrome or SARS first emerged in China in 2002 and in 2003 spread around the world via jet, killing more than 700 people and infecting about 8,000. Strict quarantines and other measures stopped its spread. It is caused by a new virus called SARS coronavirus. Coronaviruses are common in people and animals and usually cause nothing more serious than a cold. Animals such as palm civets were found to be infected but study showed they were not the true reservoir of the SARS virus. Earlier this month a team of Hong Kong researchers reported that bats found in Hong Kong carried a virus very similar to the SARS virus. They said the horseshoe bats, used both as food and in Chinese medicine, should be handled with great care. Shi, Wendong Li and colleagues studied other bats found in four different parts of China. They found that anywhere between 28 percent and 71 percent of the bats, depending on the species and location, had evidence of infection with a SARS-like coronavirus. Theirs was different from the virus found by the Hong Kong researchers, they said. “A plausible mechanism for emergence from a natural bat reservoir can be readily envisaged,” they wrote in their report, published in the journal Science. They said an infected bat could have been kept in a cage next to a civet in a market with the civet becoming infected and passing the virus to humans. 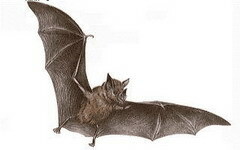 Bats are hosts of several other new viruses, including Hendra and Nipah viruses, and rarely become ill.